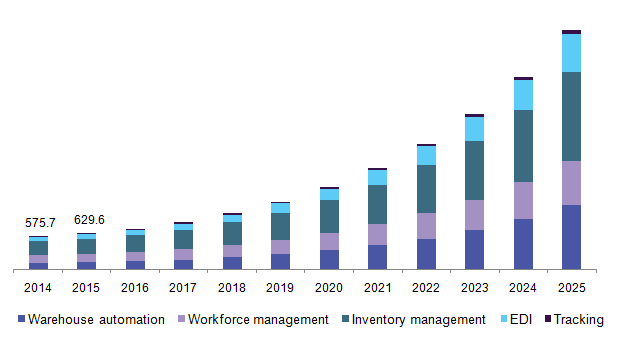 IoT in Warehouse Management Market Size To Exceed $19.06 Billion By 2025: Grand View Research, Inc. The global IoT in warehouse management market is anticipated to reach USD 19.06 billion by 2025, according to a new report by Grand View Research, Inc. Increasing adoption of Goods-to Person (GTP) technology in warehouses is expected to drive the growth. Telematics plays a major role in developing innovative solutions for fleet management. The increasing use of fleet management services by transport operators is anticipated to propel the telematics market demand. The adoption of telematics systems is expected to aid companies in reducing their fuel expenses and number of empty of runs. IoT gateways provide secured channels to transmit data. The gateways operate as platforms for applications that process data. IoT also performs functions such as protocol translation, device connectivity, security, updating, and data filtering. The growing penetration of cloud-based platforms is likely to positively impact the market demand over the projected period. The EDI solution is expected to portray high growth rate over the forecast period, owing to the increasing need for data accuracy at the customer end. The implementation of EDI is likely to reduce human errors and provide real-time information to the customer. The growing usage of mobile applications coupled with the increasing proliferation of the embedded sensor technology is anticipated to further propel the industry demand.